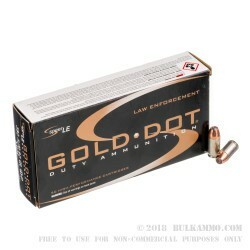 The Speer Gold Dot 380 auto hollow point round, one of the most well-known and technologically advanced bullets on the market today, is now available in the small but strong 380 ACP (Automatic Colt Pistol) loading. 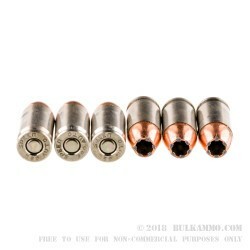 These Speer Gold Dot Hollow Point (GDHP) cartridges are loaded with heavy duty 90 grain, thick copper jacketed, hollow point, alloy lead core bullets that are fused through a unique process called Uni-Cor that only Speer uses. These Gold Dot hollow points are loaded into new, high polished, reloadable, Non-corrosive primed, centerfire, nickel-plated brass cases. These rounds hit with 196-foot pounds of muzzle energy and fly at a subsonic muzzle velocity of 990-feet per second. Many cartridges have tried, but few have reached the balance found in the Speer Gold Dot loads. The 380 Speer GDHP round is perfect for self-defense, range practice with your carry firearm, or concealed carry itself. 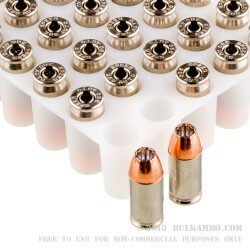 These loads come boxed up in sets of 50 rounds, with 20 boxes in each case, making a total of 1000 rounds. Get a case or 2 now to make sure you have enough 22LR in your armory.